2) Because he said so. 4) From examination of photographs. A bit of elaboration though. I am not in favour of accusing anybody of fraud without very good reason to do so, and the fact that I disagree with their findings is not a good reason. People do make mistakes, and it is possible that the threads Rogers received from Gonella were misattributed, but again, simply disagreeing with conclusions is not not evidence for such misattribution. If McCrone shows me a slide covered in red dots he calls iron oxide, or Max Frei shows me a slide of a pollen grain he calls Prunus arabica, then I assume that the dots do look like iron oxide, and the grain looks like Prunus arabica, unless somebody can show me that they don’t. I may think that the dots are actually something else similar, or that the pollen grain looks like dozens of similar species, but I do not doubt that the scientists made their identifications in good faith. Naive of me, perhaps, but once you start accusing people of fraud, where can you stop, and why should you have any credibility yourself? The answers to the first two questions, then, are not, to mind, evidence that Rogers did not, in fact, examine fibres from the Shroud. The second two, however, raise corollaries. The photo of a fragment of the radiocarbon sample sent to Thomas Ferguson, David Pearson, Louis Harner and was not very clear. I do not know what else Benford and Marino asked these experts, or what other information they were given. Thomas Ferguson was non-committal – the right hand side may have been ” “touched up to prevent unraveling”. David Pearson was more positive: “there is no question that there is different material on each side… It is definitely a patch.” This, of course, was in the days when Benford and Marino assumed that each radiocarbon piece was dated as a whole, and that the date of the piece reflected the proportions of the two materials. Actually, this piece was cut into five, and if Pearson was correct, some dates would have been all 1st century, some dates would have been 16th or 17th century, and only where the materials merged would the 14th century, mixed, date have been found. That this did not happen is evidence that Pearson was quite simply completely wrong. He also said that “medieval European weavers would … hand-stitch approximately ½ inch of new material into the old, such that it was invisible to all but the trained eye.” This half inch of blended threads is not visible at all to any eye, which suggests that it isn’t there. Louis Harmer said “the float is different on either side of the sample.” It is not clear to me if he was making the same mistake as Pearson. Finally, nobody has refuted Flury-Lemberg’s insistence that “invisible mending” is not invisible. This has become something of an impasse. Devotees insist that there is a style of mending which is completely invisible even under a microscope. The fact that it cannot be seen just shows how invisible it is. They point to French Reweaving, the Frenway Method or Invisible Mending, all of which are commercially available, as evidence that mending can be invisible, but they’re wrong. No actual invisible mender is so foolish as to claim that his mend is actually invisible, even under a microscope. Indeed, as Flury-Lemberg humourously pointed out, how could you see what you were doing if your work disappeared in front of your eyes! The last resort of the invisible mending faction is to claim that it was carried out in a style since lost to us. So not only is the invisible mending itself invisible, but so is the invisible mending technique! Quibbling with Donna Campbell cautious statement is not a rebuttal. In fact, she was examining something unique: a photograph of the Oxford sample taken by Oxford before its destruction during the carbon dating process. Fuery-Lemberg never examined that photograph nor did she EVER examine the samples before or after their removal. Her first view of the Shroud itself occurred after the carbon dating. She also stated at a protocol meeting before the carbon dating that the Shroud was all the same composition. “The wear and tear of the frequent exhibitions (ostentations) and the removal of pieces for relics required repair of the Shroud. The most well-known of those who repaired the Shroud was Blessed Sebastian Valfrè. Id appreciate any citations to the contrary. The reweaving theory is not proven- John Jackson says it cannot be seen from his 1978 photographs of the bandings. John Klotz presumably accepts Flury_Lemberg on what remains of the cloth so implies that the reweaving must only be within the sample- but exactly within it or is there some original and some the new weave- if so this would not explain the consistency of the dates from different parts of the sample- as shown in Hugh’s helpful chart. It is about time for those supporting the theory to respond to Flury-Lemberg and state exactly where they think the reweaving is and whether it is a total reweave or a mixture of old or new. The tiny amount of cotton fibre identified within the sample certainly rules that out as part of the reweave-you cannot,of course, have an invisible reweave using a different material. I do like the idea of the invisible weavers creating a weave that they and presumably no one else can see as they sewed. Some feat! The onus is on the reweavers to firm up if they want to be taken at all seriously. Have you read or examined the Pam moon article and the report that was delivered at the St. Louis Conference or is it just too much of a bother? No I have read it and am unconvinced that any reweaving took place. I was referring to the photo from 1978 that Jackson used to say that there had been no disturbance of that corner. It was then that he put forward his carbon monoxide theory which Oxford tested out without success. Please firm up where you think the reweaving took place, and how far it extended and whether it was in linen or cotton. As the Flury- Lemberg article says there is no one who has actually examined the weave close up who has seen any, reweaving at all. You must produce evidence, not speculation by people who have no expertise in ancient textiles and may never have seen the Shroud close-up. Jackson did not ever say there was no disturbance to the corner of the Shroud in question used for the radiocarbon “dating” of the Shroud. He simply said that the 1978 photos showed no disturbance. Those are two different things and should be properly distinguished. So what are you suggesting Robert? That there was a reweave but it did not show up in the bandings and Jackson was therefore wrong to say firmly – in his paper on Shroud .com ‘A new radio-carbon hypothesis’- that the reweaving hypothesis was discounted? i am simply asking for some firming up of the argument that there has been some reweaving. It goes no further than speculation in anything I have read so far. Choose. 1) there was a reweave which is totally invisible however close you look at this corner of the Shroud or at photographs taken before 1988. But surely if it is invisible, you are unable to say whether it exists or not. 2) there was a reweaving within this corner of the Shroud which extended beyond the radio carbon sample but cannot be seen by textile experts who have examined the Shroud close up before or after 1988. 3) there was a reweave which by sheer coincidence was within the sample area which is why it could not be seen on the Shroud by experts after 1988. It was reasonably consistent in the mix ( or there was a total reweave of new material within the sample area but not outside it around 1325) so that each of the three sub- samples came out with dates close to each other as high has shown. Please say which you favour or provide an alternative. I believe that Enzo Delorenzi’s remarks referred entirely to the patches over the burn holes, and not at all to any supposed mending of a corner. Anybody with access to Shroud 2.0 can examine the entire Shroud in better detail than anybody looking at the real thing without a microscope, and although there inconsistencies in abundance, and signs of extracted threads, I can find no evidence of repairs anywhere except in the patch areas. I challenge anybody to find any and point them out. I find no evidence of any reweaving in any photographs that I have seen; the only expert to declare that there was definitely a patch is demonstrably wrong, and two close examiners of the whole cloth have also seen no reweaving. The Oxford sample shows no evidence of reweaving (in spite of any directed notions), the remaining Arizona sample shows no evidence of reweaving, the photo of the radiocarbon area before it was cut out (as at https://shroudstory.com/2013/06/29/a-bit-of-interweaving-in-the-arizona-sample) shows no evidence of reweaving. I don’t believe the Shroud was rewoven anywhere. I don’t believe there is any observable evidence to suggest that it might have been. There is some chemical and microscopic evidence, as described by Ray Rogers, that the radiocarbon corner has some anomalous characteristics, but I find it insufficient to demonstrate that the Shroud has been mended. I have faithfully reported what was told to me and the Italian scientist will work on the reweaving hypothesis in the future since he is working on some other things we know about the Shroud right now. I do not know what Ray Rogers’ beliefs were; he did seem to be agnostic, if not atheist. In one paper he co-authored he mentioned evolution in passing but failed to say anything about where the rationality came from. Isn’t it enough to look at the ‘quad mosaic’ pictures of the Shroud, see the huge difference of color between the sample area and the image area, and determine that the C14 samples are not representative of the Shroud? The hands of the Clarissas of Chambrey referred to those patches. The reference to Valfre and to Princess had nothing to do with the patches. They dealt years later and in regard to the Princess I belive centuries later. You are grasping at straws so that you can refuse to deal with the reality of the historical facts. DeLorenzi, unlike you and I saw and examined the Shroud in person. Your argument is uninformed and disingenuous at the least. Jim, there are four quad mosaic photos to be found in the STERA image library at Shroud.com, together with a couple of enlargements. If you believe that the different colours on the quad photos represent different materials, then you must believe that the wide blue bands across three of the photos represent a different material from the orangy-yellow field, and that the dark green corners on all four photos represent another, and that the deep pinky-red area of the dorsal legs represents yet another. This is absurd. The similarity between the colour distortions on all four photos suggests that they are due to the similar way each photo was lit, and nothing to do with the composition of the cloth. John, I read the quotation entirely accurately the first time, thank you, and believe that the ‘darning’ referred to by Delorenzi was that of the repairs to the burn holes, and not to anywhere else. It is apparent from the clumsiness of the patching, and the fact that extra patches of a different material were added to the original ones, and the black stitching that used to be easy to see which was always used by Sebastian Valfré, that several hands, at several different times, contributed to these repairs. As I explained above, anybody today can examine the Shroud more closely than Delorenzi could, simply by looking at Shroud 2.0, and I challenge anybody to find any evidence of any mending anywhere other than in the areas of the burn holes, where the stitch holes from the patches are still evident. In what sense is my argument uninformed? Would you care to inform it? What is absurd is to think that the discontinuity in colouration is due to the lighting. Just focus on the area of the sample, see how the dark green follows the edges of the holes at the bottom and the edges where a relic and the earlier, pre-1978 sample was cut out. That dark green is a sign of contamination. 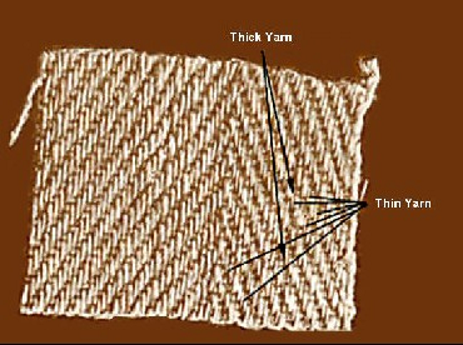 The fact that the dark green runs parallel with the weave near left edge and has a sharp end, instead of gradually fading as near the holes, indicates or at least implies a systemic or intentionally man-made contamination, such as possibly a re-weave, though could also be the applying of dyes or colourant to hide a patch, say if at one time the big rectangular hole may have been patched and coloured to hide the ugly hole. I doubt they would have put it up for display with that big eyesore. I find it strange that so many people focus on the colour anomaly which occurs in the bottom left hand corner of all four photos, but completely ignore – and I do mean ignore; to my knowledge no one has commented on it in spite of my continuously pointing it out – the much larger colour differences which cross the entire photos. If colour means content, then the shroud is divided into broad strips of different material. The conclusion that the Shroud was in Constantinople in 1204 is strongly supported, both historically and empirically. Such a conclusion means the radiocarbon dating of the sample cut from the Shroud failed to date the Shroud correctly. However, why the radiocarbon dating of the 1988 single sample cut from the Shroud did not properly date the Shroud’s true age remains a valid unresolved question that merits continued research. TSC is most interested in exploring “enhanced contamination” other than that associated with a reweave. Others are encouraged to continue to investigate the reweave hypothesis. I would add the picture of the Shroud in the Hungarian Prayer Codex of ~AD1195, with the signature L and F shaped patterns of holes, also sheds a lot of doubt on the validity of the C14 tests. Until proper representative sampling is carried out in accordance with a valid sampling protocol, the validity of the results from the single grab sample in 1988 must remain ambiguous and debated, whatever the cause might be of the mismatch from an earlier date, in view of other indications that the Shroud is the authentic burial cloth of Jesus of Nazareth. These indications may include: 1) Fanti’s mechanical testing suggesting the possibility of a 1st century date; 2) Historic arguments that the Shroud was in Constantinople in 1204; 3) Indications from the Hungarian Pray manuscript that distinctive features of the Shroud were known in 1195, prior to the alleged C14 dating; 4) Forensic arguments that the image is that of a real crucified person who suffered the punishments reported in the gospels including a crown of thorns and percussio wound to the chest; 5) the otherwise inexplicable cause of the image; 6) the unsmeared blood stains; 5) Presence of Jerusalem limestone; Etc, etc! 100% agree with Daveb. I don’t know why expert scientists are still accepting C14 results. Why can’t they understand sampling procedure was wrong. We never take grab samples to decide to get the clear picture of any event. I am inclined to agree with Robert who has written about “‘enhanced contamination’ other than that associated with a reweave.” It is the hypothesis that Ian Wilson has favoured and it is worthwhile reading what he has to say about it in his book “The Shroud; the 2000-year-old mystery solved. We will have to wait and see what Professor Giulio Fanti can say about thirteenth-century reweaving in the future. You are not persuaded of authenticity. What is your favored explanation of the image? Currently I favour Garlaschelli’s idea about an acid-tainted paint, with the paint almost entirely, either by age or design, washed or rubbed off, leaving nothing but degraded cellulose. Whether this was applied with a paint brush, or by placing the cloth over a smeared bas relief, or some other method I can’t really say. Of course there are objections to this hypothesis, which many people, including myself, give some weight to, but at the moment I do not find them sufficiently cogent to persuade me of the Shroud’s authenticity. Thibault Heimburger’s paper, https://www.shroud.com/pdfs/thibault-lg.pdf, examines what Garlaschelli actually produced and makes good observations about their failings even while admitting that they are the best artificial versions so far. I think there is certainly more to be done, but if Garlaschelli could be bothered to take Thibault’s objections to heart and make appropriate modifications, I think a more acceptable fac simile is far from improbable. I do not reject an ‘unscientific miracle’ out of hand – just there’s nothing to be investigated if that’s how it was done – but I do not find any of the ‘scientific miracles’ at all convincing, be they of mysterious emanations of cadaverine, ammonia, neutrons, electrons, electromagnetic radiation or whatever. I think Daveb currently pins some hope on earthquake effects, which would at least be more explicable, if any evidence could be found for them apart from Giovanna de Liso’s snakes and keys. There is a mass of new material on painted linens as scholars turn their attention to them. So few are left as the surfaces disintegrated with folding and with the wear of time, probably about twelve good ones from the thousands that are recorded in church inventories. The Shroud seems to be a typical linen that was once painted with the linen surface being discoloured by centuries of gesso and paint being placed over it in the way that the medieval manuals laid down. Sadly Charlotte Villiers, an expert on painted linens, who saw the Shroud as just this, died tragically young- I would have loved to ask her why she came to this conclusion about the Shroud. My own view is that Garlaschelli is being unnecessarily complicated as if the Shroud was somehow unique and not typical of its time when painted originally. I am in no rush to have my hypothesis proved as new research is continuing apace and I think that within the next five to ten years the Shroud will fit into the once painted linens category with experts agreeing on this. We will see. For the time being I am happy to leave it up to the experts, in this case those who deal in a daily basis with ancient weaves and the conservation of the few painted linens that survive. The weavers tell me that the Shroud is a typical product of a medieval treadle loom as if there was no argument about it- the 113cms width is the give away as this was a common width in medieval cloth – the six linen strips of the Zittau Veil of 1472 sewn alongside each other come to a total of 6.80 meters! As so often, time , developing technology and expertise will come up with fresh approaches- I think they will end up with a fourteenth century origin but what’s the rush when there is so much new work on ancient linens under way which will probably provide a definitive answer. Nonsense. Have you ever laid gesso on a piece of linen and try to remove it mechanically without damaging the fibers? STURP ,of course, found ‘large’ quantities of calcium carbonate which is an ingredient of gesso still on the Shroud and this would suggest that it simply disintegrated over the centuries. But I leave all this to those who deal with such linens. Flury-Lemberg was a textile specialist, we need conservationist experts who deal in painted cloth surfaces to become involved. Charles, did you ever put gesso on a piece of linen and tried to remove it after it dried? According to one of my Shroud contacts, Michael Tite is still lecturing and includes the Shroud. I am told that he says in his lecture that it was he who insisted on textile experts being present at the sampling to rule out any possibility of any reweaving in the sample. No Mario, I have not but that is irrelevant because removing modern gesso just put on is something different from medieval gesso folded and unfolded as the Shroud was over centuries. The calcium carbonate found by STURP needs a better explanation than the ‘ accumulations of dust’ that STURP postulated. I think that within five or ten years time this whole debate may have become irrelevant as it may well be that advances in the study of formerly painted linens will explain the images as discoloured linen from centuries being under gesso and paint. The iconography of the images, especially the all over front and back scourge marks, fits so neatly with the fourteenth century that that is another vital clue. Then the radiocarbon date will make sense and not be seen as an aberration. But it will be the conservationists who make the breakthrough and there is nobody here , including myself, who has the right qualifications to pronounce on this. It is just that it is a growing area of speciality so soon someone will come into the debate and sort us all out with a definitive explanation of why the linen is discoloured the way it is. At least Dr.Tite does not say that the image is a painting or was produced with the use of acid or some scorching technique. Are there examples of acid-tainted paint being used in other artifacts? Though acid-paint may provide better results than Colin’s flour based experiments, his model (to my knowledge) has the advantage of being ‘within the grasp’ of a medieval artisan than Garlaschelli’s. It is obvious that earthquakes do not produce images and even Professor Giulio Fanti has sort of given up the corona discharge hypothesis and will be working on both thirteenth-century patch and contamination in the future. A scientific conclusion of one skilled in: Parapsychology (a collection of uncorroborated anecdotes); Psychology (an empirical science lacking a consensus in theoretical and experimental foundations); Archaeology (one of many “sciences” that Ernest Rutherford might have categorised as “stamp collecting”) . daveb, alias Mr. David Belz, who is not a scientist, continues with his provocations, protected by two people whom I have identified. One wonders why CB was silenced and daveb can continue provoking. He knows next to nothing about Parapsychology and I doubt that he has read any journals devoted to psychical research. He lives in a country that has earthquakes now and then. Apparently he has not heard of a single case where some image was produced on cloth and yet he dares toy with the idea that the Shroud image may have been produced as a result of an earthquake. Louis had Max Patrick Hamon kicked out of Dan’s blog. Now he’d like to have daveb out too so that he could unchallengingly promote his Academia articles and untruths about the Shroud. That is not correct. Max was not kicked out. Max is welcome to submit comments that I will look at first before they appear. Louis had nothing to do with this. This applies to three other individuals, as well. And contrary to comments elsewhere, CB has not been kicked out. He has gone silent. He has not commented here or posted to either of his own blogs since August. And just for the record, I object to the unsubstantiated accusation that Louis is promoting untruths about the shroud. Actually, I have attempted to comment here, Dan, including one recently to your Paris posting, more to test whether your block/tripwire announced on the BarrieS/Indianapolis posting was still operating. But when I hit the Send button, there’s nothing on screen, not even “your comment is awaiting moderation”. So maybe it’s your settings that are at fault? I rarely feel the need to comment in any substantive way these days, having arrived at what I consider a working model for the TS body image that deserves consideration. Is Thibault still checking it out as he said he would? Yesterday’s comment from Hugh, backing the idea of acid action in a medieval scenario that degrades cellulose, was one I checked out with sulphuric acid and found wanting, if only that acid appears to preferentially attack the hemicelluloses of linen, causing the fabric to disintegrate before it becomes appreciably coloured, at least at ordinary temperatures. As a close friend of Max Patrick Hamon, I confirm Dan did kick out Max Patrick Hamon from the blog… unless Dan’s settings are at fault. Actually Max cannot/is not allowed to comment (each time he has hit the Send button (I was myself a direct witness of this), there is nothing on his screen, not even “your comment is awaiting moderation”. Indeed Dan had already threatened to kick out Max once or twice in the past). Still the fact remains, most curiously Max has been silenced from August the 10th 2015 onward i.e. just after Louis (a freelance journalist) asked Dan to do sthg about Max as the latter challenged Louis to prove his exegesis of Jn (the empty tomb episode) was wrong (Louis with his mouth full of the name of “his giant” in Biblical exegesis disdainfully told Max he “would be laughed out of court”. However Louis has NEVER substantiated his claim and demostrate Max’s exegesis was wrong and did ask Dan to Silence Max, which Dan did. Until proven otherwise, Max WAS kicked out of Dan’s blog and Louis did have SOMEthing to do with this. Each time I have hit the Send button, there was nothing on screen, not even “your comment is awaiting moderation”, which leads me to think indeed you did kick me out of your blog (as you once or twice had already threatened me to in the past) and silence me unless your settings are at fault (see Colin Berry’s case). If Max is really “welcome to comment”, how come he cannot? How come Dan doesn’t even reply to Max’s emails? Doesn’t Dan left hand know what his right hand does? I do not know who Chantal Boisselier is or what she does in life, but I got the impression that she made the comment on behalf of someone in France, putting out a feeler to see how it will be received. I have to tell this lady that I do not have to promote any of my articles and if a link is provided to one of them it is only because it is relevant to the discussion taking place. Not only have some of my articles been preserved in the libraries of a renowned university and institution, some of them have even been posted online at the request of the webmasters. I am sometimes even consulted by scholars with PhDs, authors of important books, who also teach at universities when they are preparing their own papers and what is discussed is kept confidential, in the same way that documents and reports prepared after examinations, research by individuals or institutions and so on that are sent to me are. I have never attacked anyone on this blog. What I have done is to defend scholars and scientists who have been the object of nasty insinuations and character assassination. I have also defended myself when some commenters have hurled insults at me, trying to get me out of the blog either by poking fun at me or by making little of what I write, even using foul language in the process. As far as I know, none of them have published anything in a magazine or a daily. I am not here to flatter anyone in order to gain support from other commenters or to resort to tactics like pitting one commenter against another. On the contrary, I try to help by posting a link to a bit of news or some article that commenters will find useful. Apparently, he has. See the photographs at http://www.acheiropoietos.info/proceedings/DeLisoWeb.pdf. This is just what I meant re one of Louis’ promoting untruths… This comment of his is not reliable at all. Indeed it is (deliberately?) misleading. One wonders whether this paper was peer reviewed. The author is not a scientist. If it could have been taken seriously Professor Giulio Fanti would have been delighted and gone ahead with his corona discharge hypothesis, however he seems to have given it up. Based on Gospel account I cannot agree on Bodily Resurrection. Looking at the properties of the Image on Shroud and image formation most probaly due to dematerilization of the body. As such I suuport Spiritual resurrection. That is why those who support bodily resurrection like to promote earth quake theory. It is not possible earth quake to form both frontal and dorsal image on the wrapped burial cloth. Sampath, a few days ago you defended the “earthquake theory”, remember? You are an environmental engineer and in the right place to find out what can happen during an earthquake. My view is this: the Resurrection of Jesus was an unique event and we should not expect to rise like he did. Louis, Where did I support earth quake theory? I never supported an earth quake theory as it never gives a dorsal and a frontal images. My hypothesis is dematerialization and emission of radiation from inside to outside. That is the only way you get both frontal and dorsal images. You must also think about why it happened only to the body of Jesus if he was just one among many wrapped in a shroud in Jerusalem during the period. Professor Giulio Fanti has sort of given up the idea of corona discharge, which was linked to the “earthquake theory” and that is what he has also done by abandoning the possibility of light having something to do with image information. Yes there is a possibility of anything. But this does not mean that I support that theory. From earth quakes you never get frontal and dorsal images. Do you have any image that was produced as the result of an earthquake? Yes I saw De Liso images. But it is only oneside image. So that is why it is a possibility. If he providing wrong information then he is cheating. No, I wasn’t talking about the de Liso images because she is not a scientist and her paper was probably not peer reviewed. I was just asking if you knew about any image that was produced as a result of an earthquake. I have not seen any. It is obvious that in the case of the Shroud both frontal and dorsal images were created at the same time, so what de Liso produced is irrelevant. No frontal and dorsal images can be formed by Earth Quake on a wrapped burial cloth. And that is why I did not support the earth quake hypothesis. I support only Dematerilization hypothesis. If our exchange is read right from the beginning it becomes obvious that you changed your mind. I have relied on Professor Giulio Fanti’s research and he has abandoned the corona discharge/earthquake hypothesis and also stated that light was not involved in image formation. I never changed my mind. You can decide what you want. I am not worried. According to your statements only Prof Fanti change his mind about Corona discharge. Carrol in part writes about the book , “The Soul Fallacy”. Just reading the reviews on Amazon he appears to uses science to argue that humans are just part of natural world and subject to the same laws. Since I have so many open the hard questions that science can’t answer right now I’ll keep an open mind on the idea of a soul. Quite correct. The link was provided just to let intererested readers know what is being said. Swinburne has not been convincing with his emphasis on natural theology, which obliges him to ignore the Gospel according to John. You must have read that Daniel Dennett is also cited in the article to which a link was provided in the previous comment. An uncaused universe is a metaphysical impossibilty, as Paul Copan states in this book review. Were you able to read something about Dom Bede Griffiths? As you know there are scientist on both sides of the issue of God. One of great scientist Francis S. Collins wrote a book, “The Language of God-A Scientist Presents Evidence for Belief.” Oh, and Mr. Collins believes in the God of the Bible. Another great book is, “Quantum Questions-Mystical Writings of the World’s Greatest Physicists.” It has writings from people like Heisenberg, Schroedinger, Jeans, Pauli and others. I reread this book at least once a year. We had a program on PBS TV called “Closer to Truth” where they looked at questions about the universe, God, consciousness and meaning by interviews with our leading scientists, philosophers, scholars and theologians. They have a website with all the videos they did and they cover both sides of the issues. The debate of an uncaused event goes back to at least Aristotle and Plato. One side says the Universe is uncaused event, the other sides says no it’s not, God caused it. The other side comes back and ask, “What caused god?” Some accept the idea of a metaphysical necessity the other side rejects it. William Lane Craig defends the kalam cosmological argument the other side claims his reasoning is unsound. It goes on and on. Plato’s, “Allegory of the Cave” rings true. I think we are still in the stages where reality is just shadows on the wall. I feel Jesus, Buddha, Lao-tzu and others have tried to bring us out of the shadows. This is a topic that will take a very long time to discuss, so I will have to direct you to some links to articles, reviews and interviews, which you can read whenever you have the time. It is a sequence, which will enable you to grasp the approach that is taken. Needless to say, it will be modified as time goes by, because we learn about developments in science and religion almost every,single day. I can say something about a few points you have mentioned in your comment. We are indeed in the “shadows”, however there is a clash between Buddha because Buddhism is a negative soteriology and Jesus, linked to the Judaeo-Christian tradition, which does not say the same thing. Actually, in Buddhism some concepts are very vague and, in the end, there is “nothing”. Science tells us that nothing comes from nothing and nothing goes to nothing. Viewed from that angle, the Judaeo-Christian tradition is more convincing. Note that Stephen Hawking keeps on changing his mind. He is a very good scientist, but I have the feeling he is also influenced by biology and this is a kind of guide to the direction he is taking. Just too many links had to be posted here, but it was necessary in order to drive my point home. You can always contact me by email if you wish to do so. I will be concentrating on book reviews in the next few days, but I can always make some time for you. keeping in mind that Stephen Hawking always changes his mind. He is a very good scientist. One gets the feeling that he has been influenced by biology (evolution as Dobzhansky understood it, minus the religion). the result of a meeting with the prominent archaeologist last month, part of my project involving both science aand religion. We are not in a position to ask, What caused God? We are finite. More on that later.